My family is currently studying The Primacy of Peter with a Papal Unit Study and Lap Book as we say goodbye to our dear Holy Father, Pope Benedict, and prepare to welcome our next Pope! 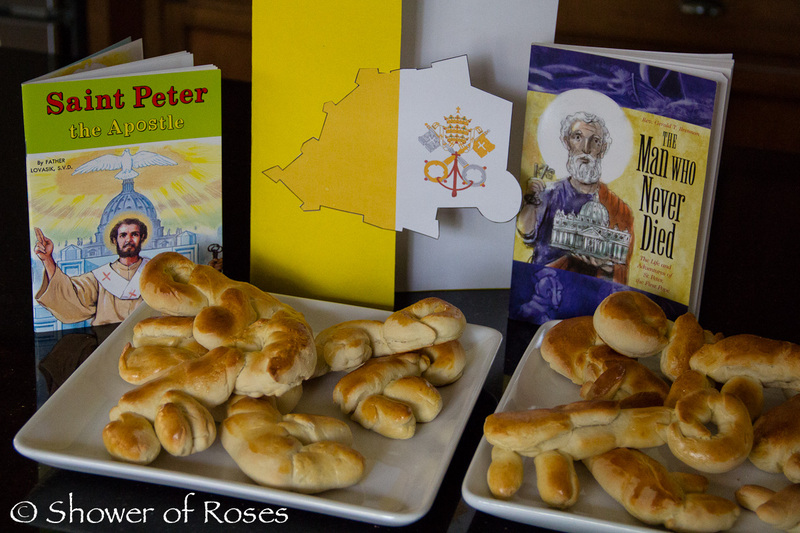 Over the past few days we have been focusing on St. Peter, The First Pope. 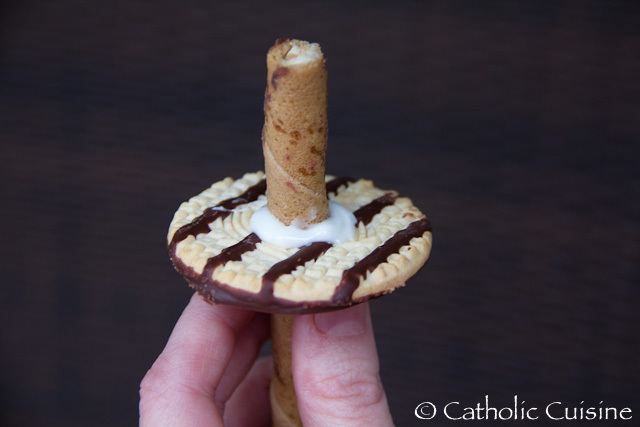 Tomorrow we will move on to Pope Benedict and other popes from the past, before moving on to learn more about the Hierarchy of the Catholic Church, the Papal Elections, and more! You can find all the details over on my other blog, Shower of Roses. This afternoon for a fun, but still Lenten approved (since we gave up sweets), treat we made St. Peter's Keys out of pretzel dough, inspired by Lacy's Edible Papal Flag. My children always enjoy creating various traditional symbolic shapes out of bread dough for the feast of St. Joseph, so I knew this would be a hit! Dissolve the yeast in warm water. Add the sugar and salt. Mix in the flour and knead until the dough is smooth. 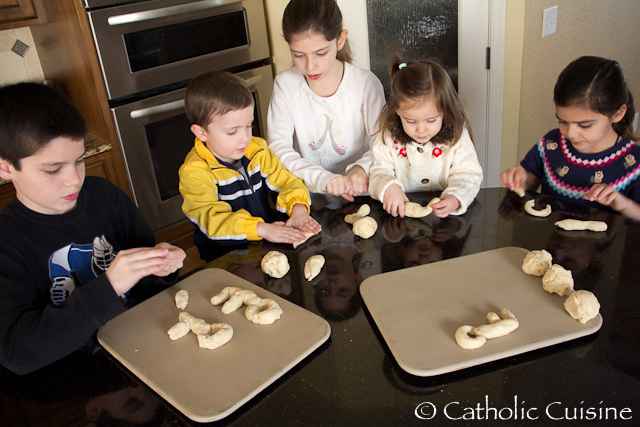 Let the children shape the dough into key shapes and place on baking sheet. Brush the dough with a beaten egg for a golden finish. Bake in a preheated oven at 425˚F for 15 minutes. 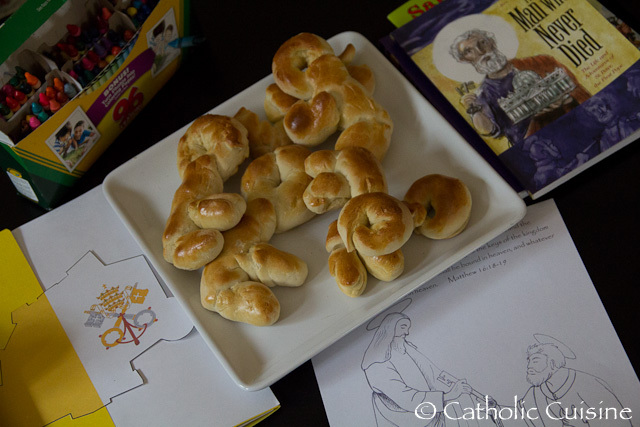 Let the children color pictures of our first Pope and Pope Benedict XVI while they enjoy their pretzels and listen to a few chapters about the life of St. Peter, The Man Who Never Died! The following Lenten dinner was submitted by Eliana Murphy. Thank you Eliana! 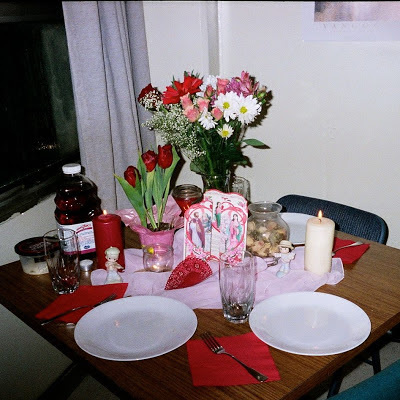 This healthy dinner works well for any day requiring abstinence from meat, so for those Catholics who observe abstinence on all Fridays of the year, instead of offering a substitute sacrifice, it does not have to be used only during Lent. It could be served with a green salad, and afterwards, grapes could be served. Preheat oven to 375 degrees. Rinse fish fillets and arrange in metal or glass rectangular baking dish. Add enough water to lightly cover the bottom of the pan (but not enough to drown the fillets!). Sprinkle with McCormick California Style Coarse Grind Lemon-Pepper Blend. Cover pan with foil and bake for 25-30 minutes. Peel garlic cloves. Rinse spinach very carefully to remove dirt and gravel if not already pre-rinsed. Use a large covered pot (7-10 qt) to cook this dish because the spinach leaves take up a lot of space until they cook down. Pour enough olive oil into the pot to cover the bottom, and add the garlic cloves. Saute for a few minutes on medium-high, then add the spinach leaves and a tiny amount of water, cover the pot, and cook until the spinach is wet and tender (approximately 10 minutes, stirring occasionally). If you are cooking a larger amount, you may have to add the spinach in batches and allow it to cook down before adding more. Peel and slice the garlic and onion. Slice the zuccini (I prefer to slice the zucchini in half lengthwise, then slice horizontally to get smaller pieces) and the carrots. Pour enough olive oil into a 4 1/2 qt pot to cover the bottom. Saute the garlic, onion, carrots, and zuchini for five minutes over medium-high heat. Add the couscous and saute a few minutes more (add more olive oil if necessary to prevent sticking). Add the 4 cups of water, sprinkle with a little salt and pepper, and cover and simmer until couscous is fluffy and the water is all absorbed, about 15 minutes. 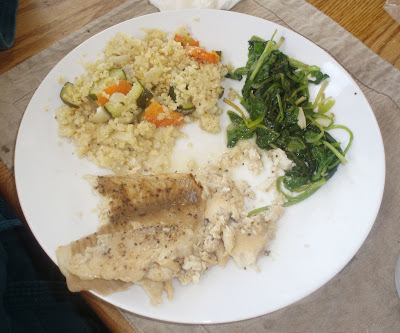 If you wish to have a greater proportion of couscous to vegetables, use 2 1/2 cups of couscous and five cups of water. For a quick version, substitute garlic and onion powder to taste for the fresh garlic and onion. Today is the feast of Blessed Francisco and Jacinta Marta, visionaries at Fatima. 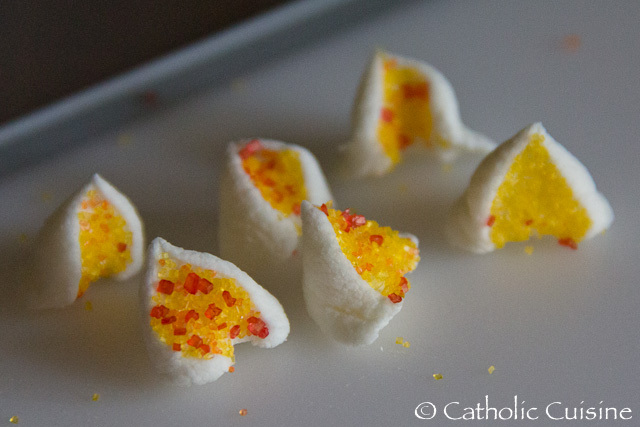 A few years ago I created these Lemony Sunshine Cupcakes for the Feast of Our Lady of Fatima and they were so easy and yummy, I am creating them again today. 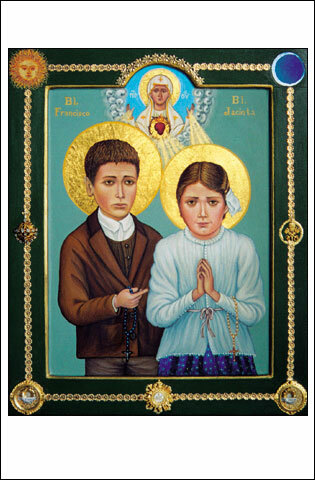 As you know, it was at Fatima, during Our Lady's apparitions, that the miracle of the sun occurred, and thus images of the sun are often used as symbols of Fatima. 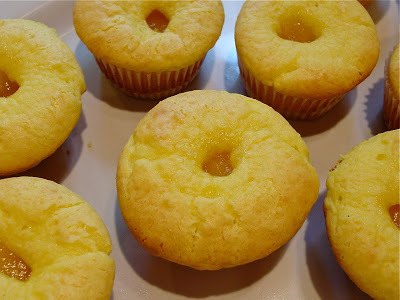 I saw the recipe for these Sunshine Cupcakes made on the Food Network as the winner of a recipe contest. We all love lemon desserts at our house, so I knew these cupcakes would be well-liked. I hung on to the recipe and the Feast of Our Lady of Fatima seamed like the perfect opportunity. The cupcakes did not disappoint. They are very lemony, and though I'm a huge cake snob, they tasted pretty darned good for a doctored box mix. I love the lemon curd in the very center, and the shortbread cookie crust. They are really sort of a mini cake tart, if ever there was such a thing. The cake is moist and tangy, but perfectly complimented by the gooey lemon curd and the sweet, crunchy crust. I altered the recipe only in that I used all the crumb mixture for the crust because I wanted the tops to be bright yellow and sunny, with the spot of curd unobstructed. Preheat oven to 350 degrees F. Line 2 standard muffin tins with 16 cupcake liners; set aside. In the mixing bowl of an electric mixer fitted with the paddle attachment, beat cream cheese and sour cream until smooth. Add eggs 1 at a time and mix just until combined. Scrape down sides of the bowl. Add vegetable oil, water, and the box of lemon pudding. Mix until combined. Add cake mix and beat on medium speed for 2 to 3 minutes. Batter will be thick. Use a 1/4 cup spring loaded ice cream scoop and place a level scoop full of batter into each muffin cup. Scoop the lemon curd into a small sandwich-size resealable bag. 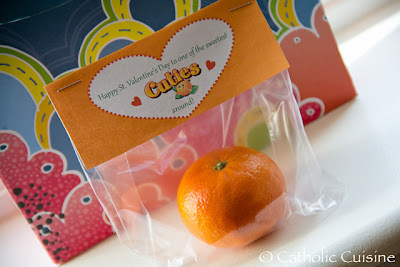 Squeeze the curd to 1 corner of the bag and use scissors to snip a 1/4-inch piece from corner of bag. 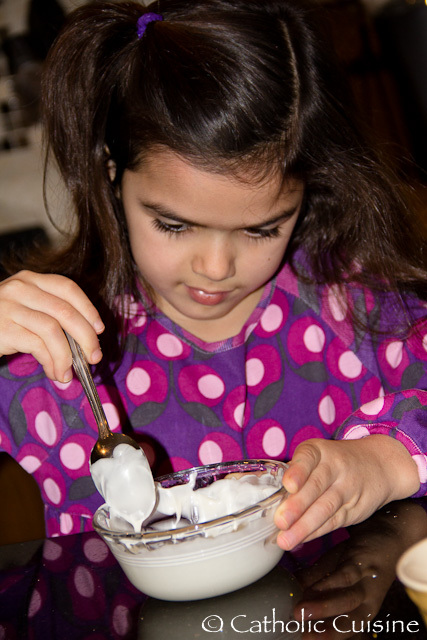 With a damp finger or the end of a wooden spoon dipped in water, make a shallow indentation into the center of each cupcake. Pipe 3/4 to 1 teaspoon lemon curd into each indentation. 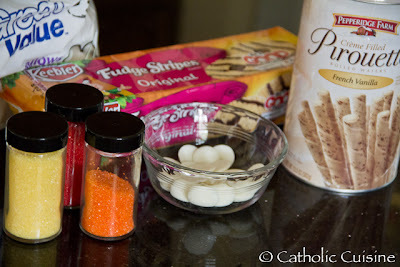 Sprinkle tops of cupcakes evenly with remaining shortbread cookie crumbs (if desired). Bake for 21 to 23 minutes, rotating pans halfway through baking, until edges of cupcakes are lightly golden brown. Serve cupcakes warm from the oven or at room temperature. 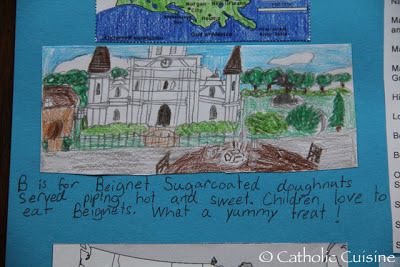 Congratulations to Landreneau Family! 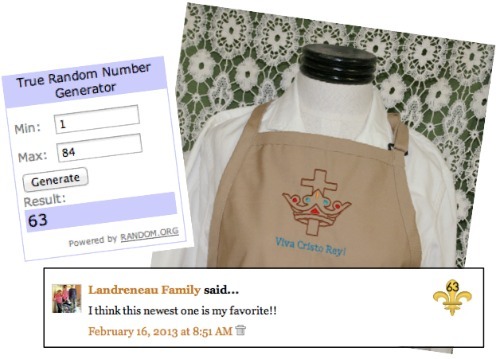 You're number was chosen as the winner of our recent Cristeros Apron Giveaway sponsored by Catholic Embroidery! I'll be contacting you soon. Thank you all for your participation in this giveaway. Thank you also to everyone who continues to shop our Apron Page here at Catholic Cuisine! 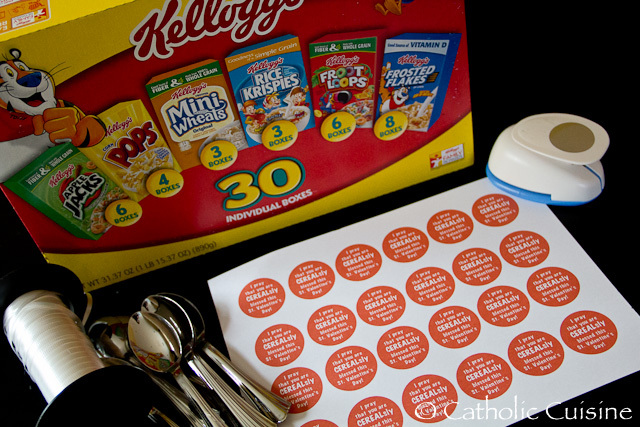 May you all have a blessed and fruitful Lenten season as we prepare for Easter! 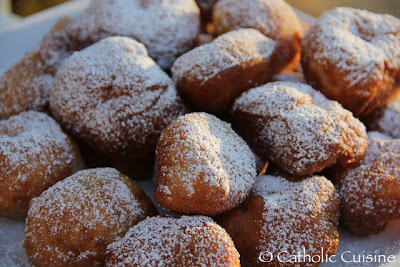 The following recipe was submitted by Veronica Gantley, from My Catholic Kitchen. Thank you Veronica! 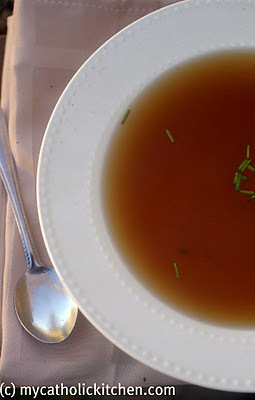 Here is a simple broth to make on Ash Wednesday or on Good Friday when we are fasting and are so mindful of our food consumption. It is also great for when you are sick. 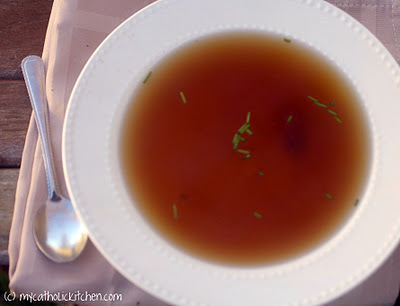 In a 6 quart stock pot add the mushrooms, carrots, celery, prunes, and garlic. Add water and bring to a boil. Add salt, pepper and bay leaves. Reduce heat to low and barely simmer uncovered for 30 minutes. Skim any foam from the surface as it boils. Strain broth and discard solids. Note: The broth will keep in the refrigerator for up to 3 days or in the freezer for 6 months. 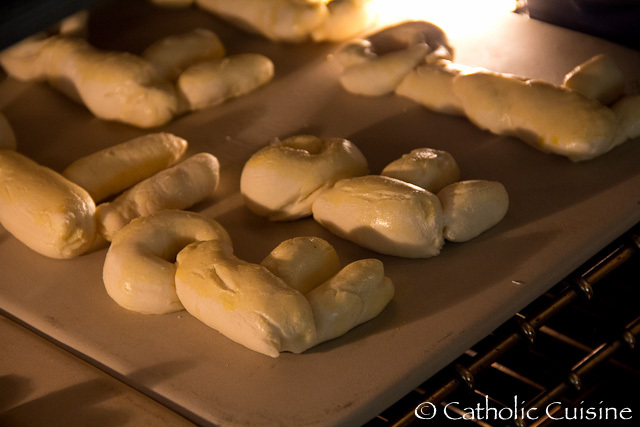 You can also find the recipe for Fasting Bread and other recipes for Lent in the archives! 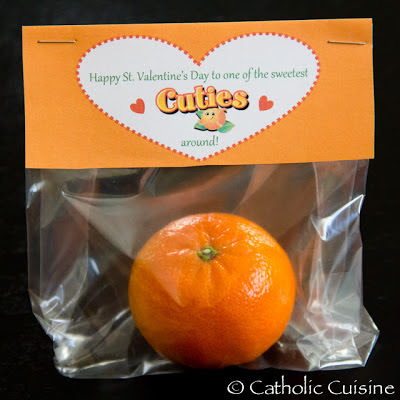 As I mentioned in my last post, we have been trying to come up with some alternatives to the usual candy treats for St. Valentine's Day this year, since it falls during Lent. 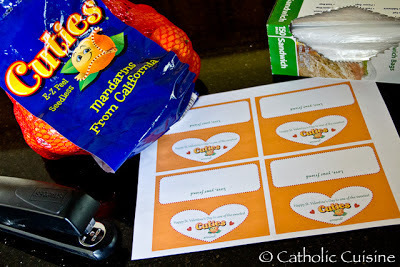 I originally ran across this idea over at Happy Money Saver and decided to create my own document incorporating St. Valentine into the greeting for one of my children to assemble and give to his friends at our St. Valentine's Party and Card Exchange this Thursday. Some of the other non-candy treats we will be giving away this year include bags of pretzels, goldfish, fruit snacks, and fruit leathers. 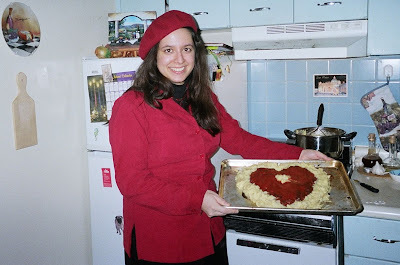 I'm so thankful that at least St. Valentine's Day is not on Ash Wednesday or on a Friday... How does your family celebrate St. Valentine's Day when it falls during Lent? 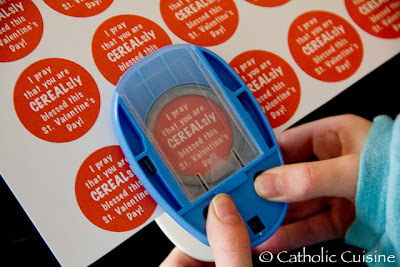 With St. Valentine's Day during Lent this year, my children have been trying to come up with some alternatives to the usual candy treats they give to their friends at our annual St. Valentine's Day party and card exchange! There are many great ideas and printables to be found online, but since we prefer our cards to include references to "St. Valentine" I have been making a few of our own and thought I'd share them with you all. 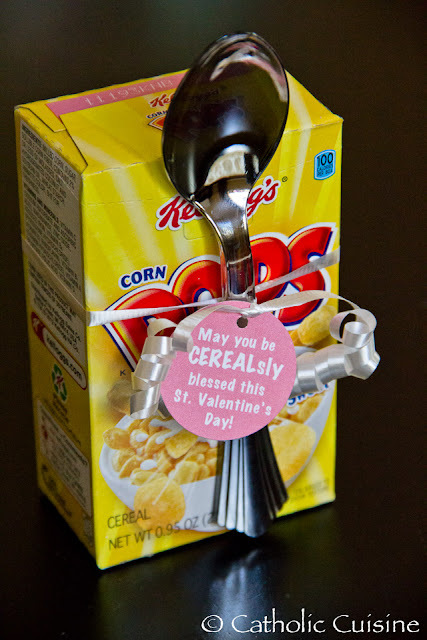 After seeing this idea online, I picked up a case of individual cereal boxes at Costco last week for my oldest daughter to give on St. Valentine's Day. We decided to change the suggested text from "I CEREALsly Like You!" 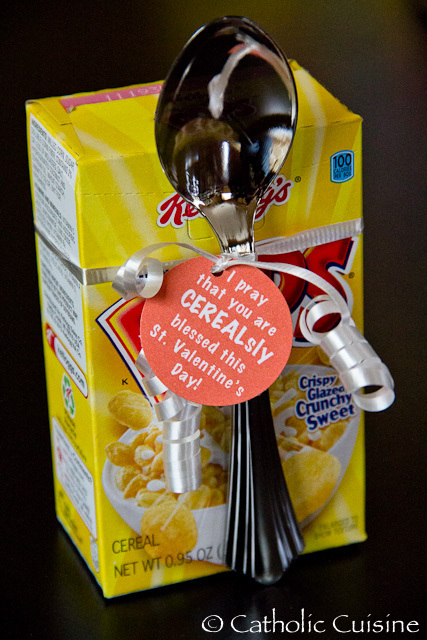 to "I pray that you are CEREALsly blessed this St. Valentine's Day!" 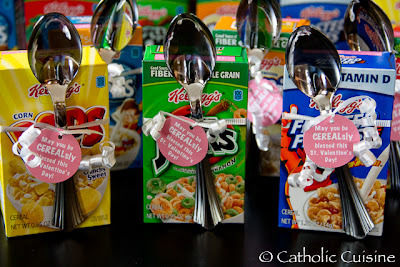 My daughter cut out each of the tags with my 1 1/2" circle punch, punched a tiny hole on one side, and side them, along with a plastic spoon, on to the cereal box with some white ribbon. They turned out so cute and she is very excited to share them with her friends! A number of years ago I shared the recipe and directions for the Our Lady of Lourdes"Fruity Pebbles" Grotto. 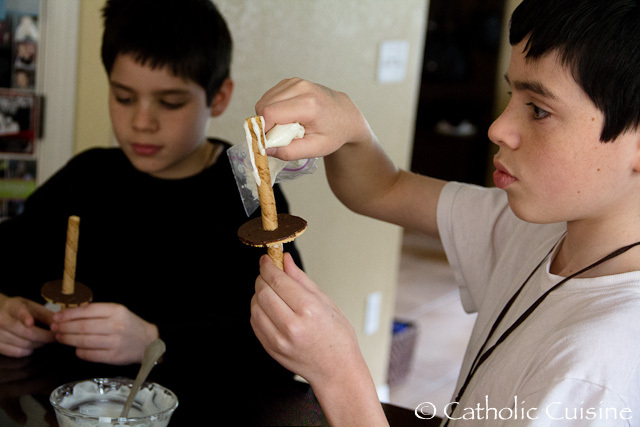 We made another version a couple years ago using Cocoa Pebbles, which my children preferred since it looked more like a real grotto to them. 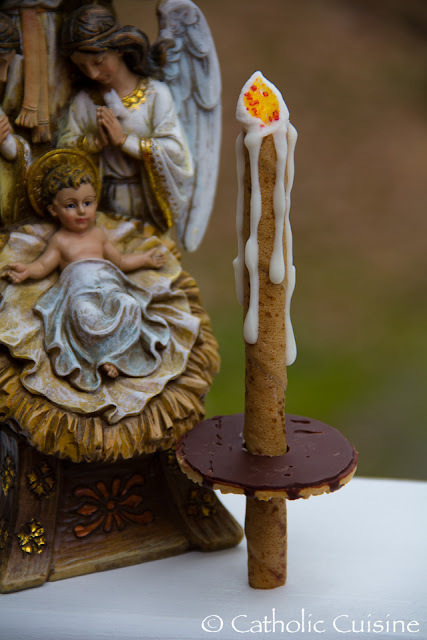 This year they used Cocoa Pebbles once again, and a small statue of Our Lady instead of one of our hand-painted saints. 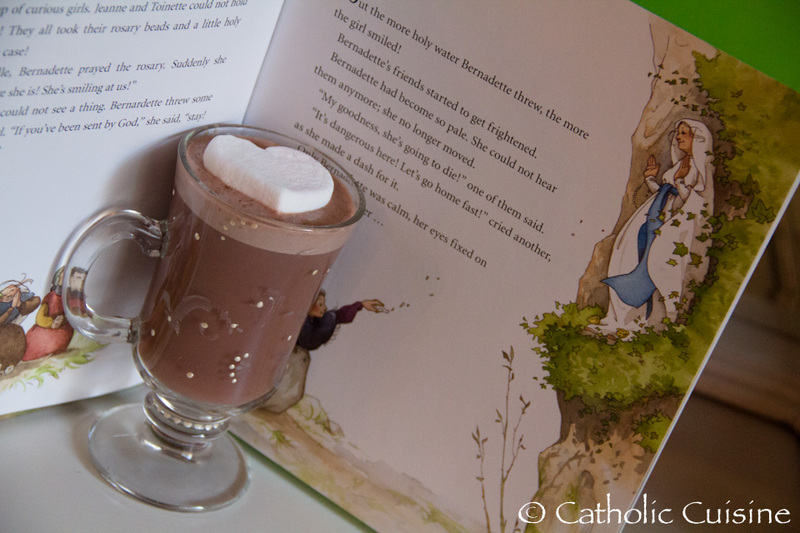 I've heated some water for some French Vanilla Hot Cocoa to enjoy while we read Bernadette: The Little Girl from Lourdes. Line a 13x9-inch pan with foil, with ends of foil extending over sides of pan and grease lightly. Place cereal mixture into pan. Top with parchment paper and press mixture firmly into pan. Remove parchment and allow mixture to cool. Before completley cooled (read: still pliable), lift cereal bars from pan using foil handles, and cut into 18 squares (or rectangles). A pizza cutter works well for this task. Use four squares for the back wall of the grotto and one square cut in half for the floor. Build up the walls with all but four of the remaining squares. Mold three squares into the roof and cut the last square in half to add to the sides of the roof. You may need to play around with it a little bit and trim the edges if you'd like. 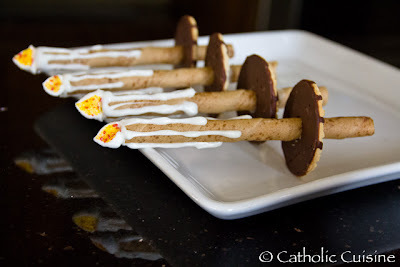 Note: As you can see, my children didn't follow the directions exactly this year, but it still turned out cute! Place a Statue of Our Lady of Lourdes inside the Grotto. 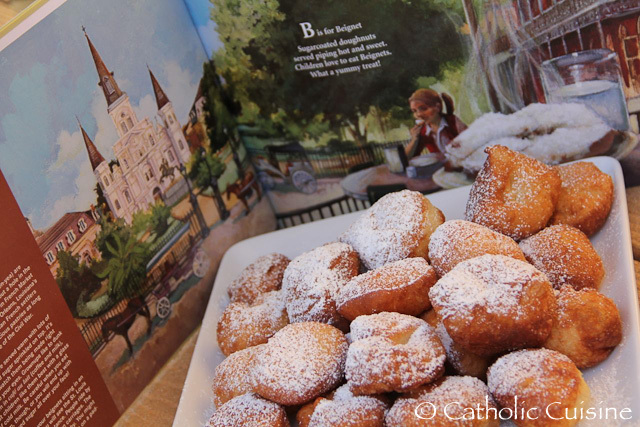 The following recipe was submitted by Lori from Living A Learning Lifestyle in honor of today's feast of Our Lady of Lourdes! Thank you Lori! In honor of Our Lady of Our Lourdes, France we are having this delicious dish. 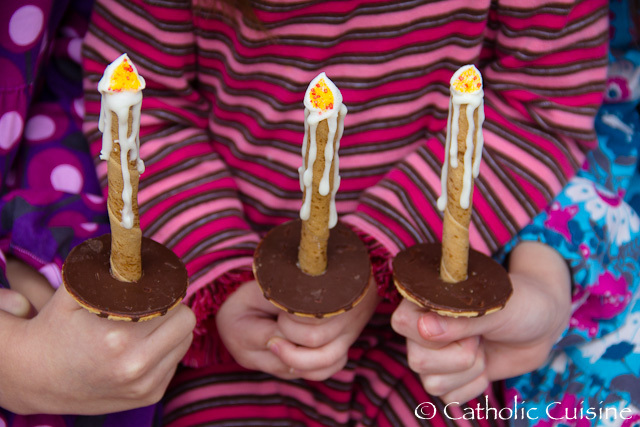 It’s super easy to make and would also be appropriate for any French Saint's Feast Day. Mix the first three ingredients together in round baking dish. Then slice butter into pats and arrange on top. Cover and cook at 350 for 1 hour. Catholic Embroidery has just launched another beautiful and inspiring apron! 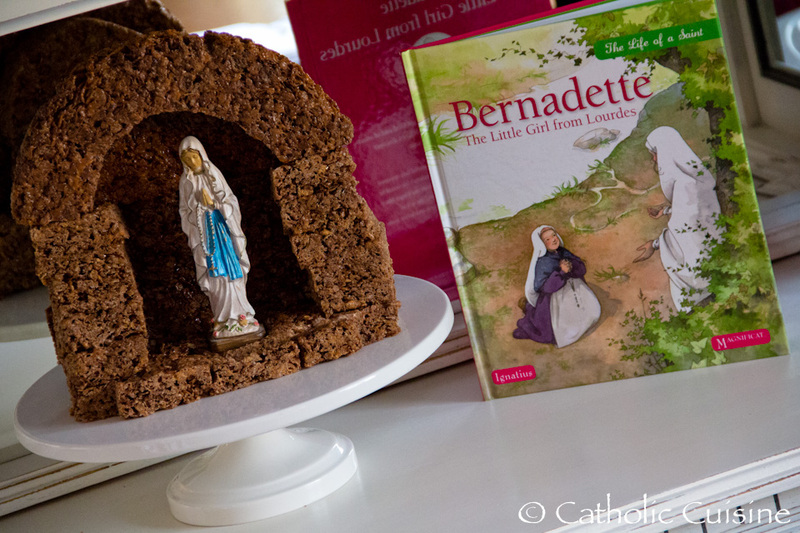 I've added it to our list of Catholic Aprons available to order right here from Catholic Cuisine, or you can purchase one directly from the link below. Now is a great time to order an apron to give as an Easter gift next month, perhaps this new Cristeros Apron paired with the inspiring film For Greater Glory?! 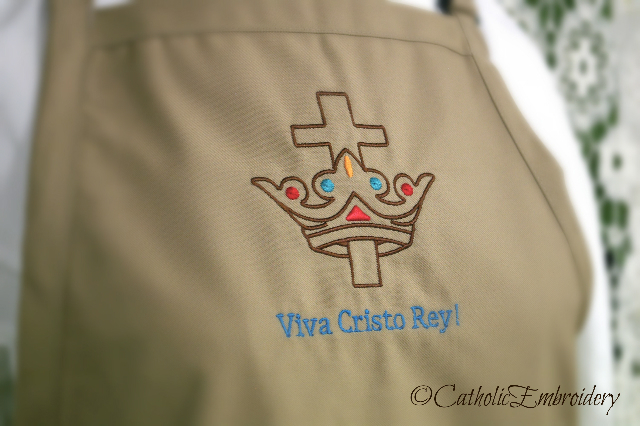 Embroidered with our Cross and Crown design and soul-stirring cry, "Viva Cristo Rey!" in honor of Christ the King in colors evoking remembrance to Our Lady's Tilma. 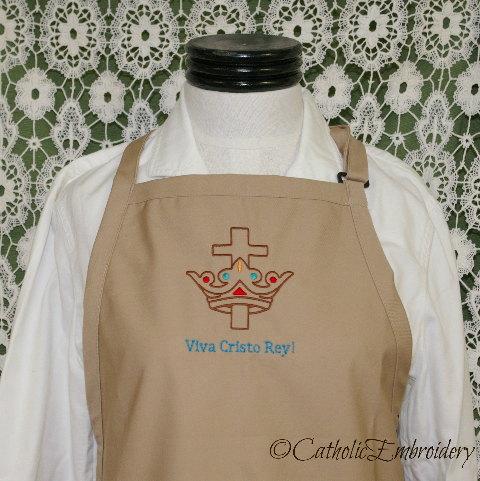 Also, in honor of today's anniversary of the martyrdom of Blessed Jose Sanchez del Rio, Catholic Embroidery has generously offered to give away one of these aprons to a Catholic Cuisine reader! Click on over to our Apron Page and check out all the gorgeous kitchen products created by Catholic Embroidery and then leave a comment on this post before Midnight (PST) on Saturday, February 16th. Be sure to leave your email address, or have it linked in your profile, so that I am able to contact the winner. BONUS: Share this giveaway on either your own blog or Facebook page and come back and let me know that you did by leaving a second comment for an extra entry! 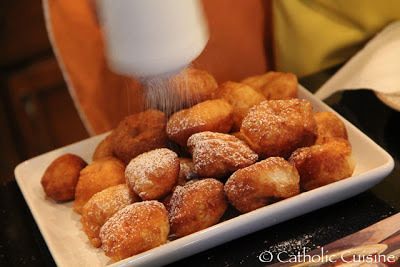 Note: Those that contribute here at Catholic Cuisine are welcome to enter as well. The winner will be announced on Sunday, February 17th. The memorial of St. Josephine Bakhita is celebrated on February 8th. 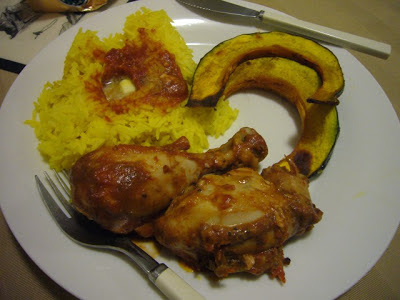 This African inspired dinner was made last year in her honor and submitted by Dust Thou Art. Since February 8th falls on a Friday this year, a Vegetarian Peanut Curry might be a nice alternative to the African Peanut Chicken. Preheat oven to 400F. Slice winter squash in 1/2 inch to inch thick pieces. 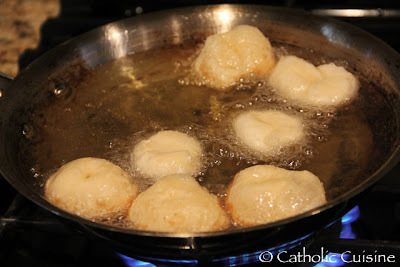 Place in a single layer in a shallow dish and drizzle with oil and sprinkle with cinnamon. Put in oven for 20-30 minutes depending on thickness of slices. Wash rice. Before adding in the correct amount of water per cooker instructions, put in a pinch each of turmeric, coriander, and cardamom. 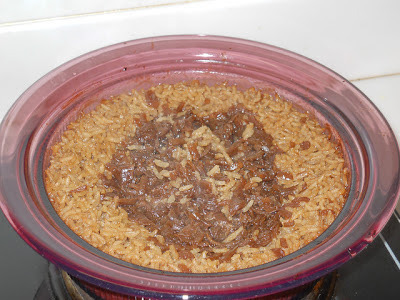 You may want to make the rice a little dryer than usual since you'll be serving it with butter/sauce. The turmeric will give the rice a beautiful golden color. 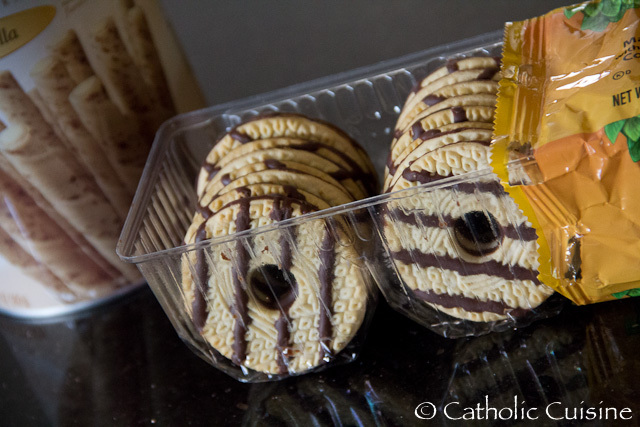 You can also cook it on the stove top according to the directions on the package (whether you're using regular, parboiled, or instant will affect the cooking time). Just add the spices with the water. For the Feast of St. Brigid today or the Feast of St. Patrick later or any of our wonderful Irish saints. This recipe is so easy, I usually have it ready to go in the pan before the oven has finished preheating! 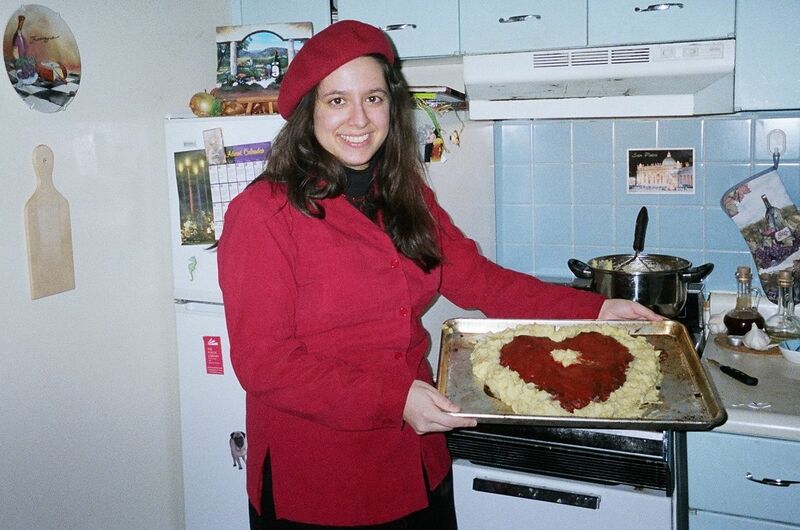 Preheat the oven to 425 F. degrees. Lightly grease a 2 inch tall cake pan or use a Dutch oven. In a large bowl, combine all the dry ingredients. I like to give it a good mix with a mixing spoon. 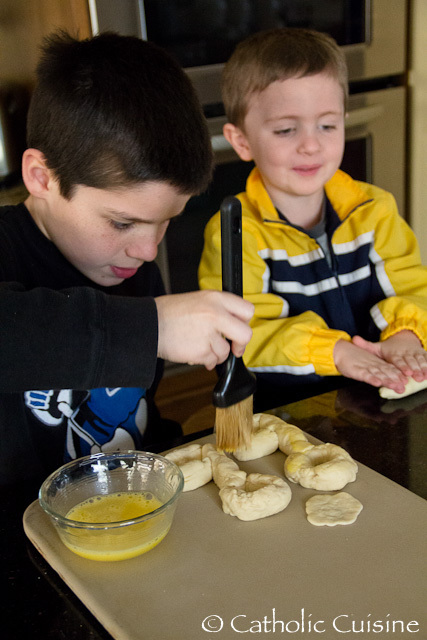 Add the buttermilk to form a sticky dough. Place on floured surface and lightly knead. DOn't get heavy handed with it! Too much kneading and the gas escapes making your bread heavy and thick like a brick. 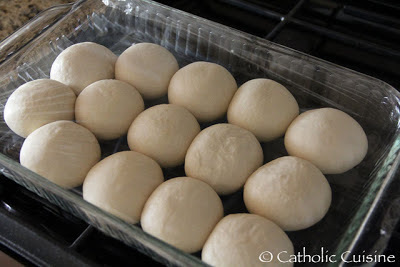 Shape into a round flat shape in a round cake pan and cut a cross in the top of the dough. Cover the pan with another pan and bake for 30 minutes (this simulates the bastible pot) if you aren't using a Dutch oven. Remove cover and bake for an additional 15 minutes. 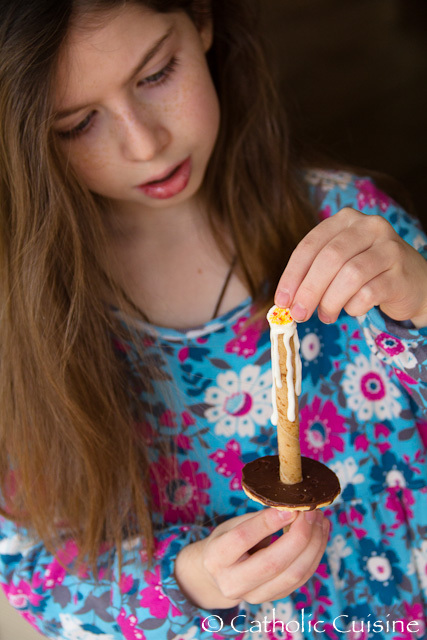 It turns out a delicious, rugged crunchy outside but a soft, melt in your mouth inside. The bottom of the bread will have a hollow sound when tapped so show it is done. 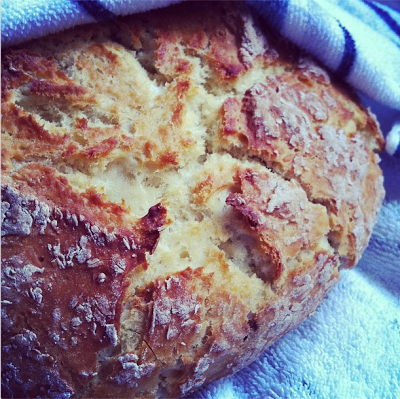 Cover the bread in a tea towel and lightly sprinkle water on the cloth to keep the bread moist. 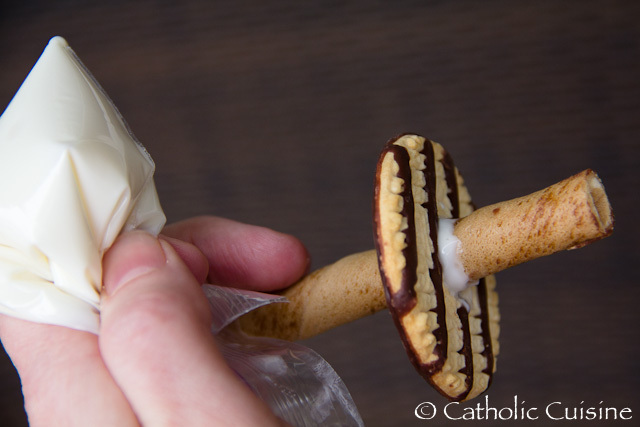 Slice it thick while it's still warm or let it cool completely and you can slice it thinner. Don't forget the butter!